The Milk thistle project began in 2009, with funding from the Washington State Noxious Weed Board. The project focuses on eight properties in the Woodland area which is an area where there is a number of active agriculture producers. Milk thistle is listed as a Class A noxious weed, meaning eradication of the plant is required by State law. This plant is a serious threat to livestock as it is a nitrate accumulator and can cause poisoning which can be lethal. Also, plants can injure livestock and dense stands shade out forage species that are essential for livestock management. 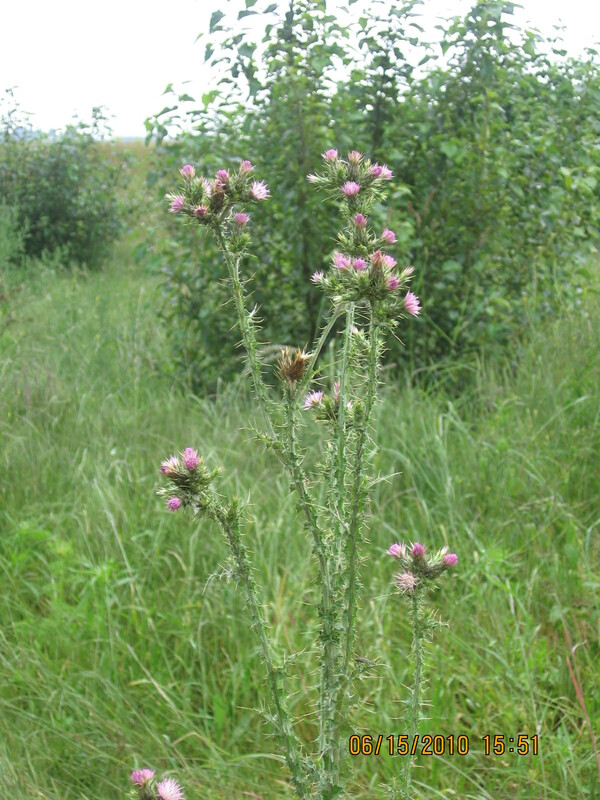 When the largest site was first noticed in a fenced areas (approximately 5 acres), it was 75% covered with Milk thistle. The landowner was contacted and we began working with them to control the Milk thistle and develop a management plan. The first year it was treated, in 2009, there were over 500 mature plants on the property. Treatments in 2010 and 2011 resulted in the dramatic reductions of plants. By 2011, five more small sites had been discovered to contain either Milk thistle or Slenderflower thistle, also a Class A noxious weed. The number of sites are small and it is important to contain and control the existing populations of these two species. Since 2009, we have found fewer and fewer plants each year and expect to find less than 10 plants in 2013 at the initial property, our largest infestation site in the county. We are seeing plants being tracked to neighboring properties, but all treatments to date have been very successful. With continued landowner support, we can achieve eradication of these plants.